I am having so much fun with my Bold Brights card stock and Stampin’ Pastels at the moment and couldn’t resist sharing my latest birthday card with you – how good do these colours look together? 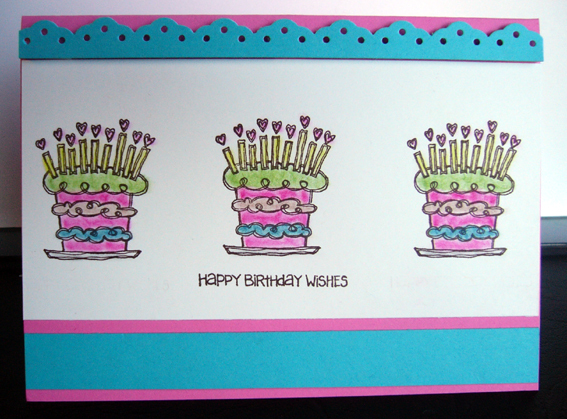 I’ve used Pink Passion and Tempting Turquoise Cardstock and Stampin’ Pastels as the main colour theme, and repeat stamped the Happy Birthday Wishes from Fun and Fast Notes in Chocolate Chip, missing out the sentiment (stamp on edge of stamp pad) for the end images. Then using applicators I have pasteled the images with Pink Passion, Tempting Turquoise, Yoyo Yellow, Green Galore and Not Quite Navy. You might notice that the strip of Eyelet Border at the top is raised on dimensionals – this just gives the card that all important 3rd dimension. Now I know that colouring with Stampin’ Pastels can be time consuming but I find it soooo relaxing and really satisfying when the end product looks like this! As my husband shook his head at me – I just smiled and said “If only I could do this as my full time job I would be in heaven!” Alas mayby one day…. I love this fun, bright card! What a great use of the Fun and Fast Notes set and your Stampin Pastels! Perfect for any fun birthday! Look forward to stamping with you on Wednesday!